Prior to the time of John Bankes, everyday life for the ordinary Englishman or woman had changed little in centuries. What are now regarded as traditional handcrafts were employed by most people to earn a living, and the time taken by horse-drawn transport to get from place to place meant that many rural communities were isolated. Suddenly, around the end of the eighteenth century, all this changed. It was at this time that Mary Ann Stephens came into the world. The life of Mary Ann Stephens was long; it began in the last years of the eighteenth century, when the French Revolution of 1789 was fresh in the memory and the Industrial Revolution was just affecting the lives of Britons. The wonders of industrialisation were viewed as something of a novelty spectacle(1). By the time she died, in the latter part of the nineteenth century, the effects of the industrialisation were evident in the everyday lives of all Britons. When she was born, horse drawn transport would have been the norm; by the time she died the country had an established railway network that had reduced greatly the time taken to travel from one place to another, and had made many investors rich. The ‘great stink’ of 1858 had stirred MPs into providing a much improved sanitation system for London, and the Education legislation of the 1870s had laid the foundations for a system of education that was free for all people. Nowadays we are quite accustomed to great change in our everyday lives, but this would not have been the case two hundred years ago. Mary Ann witnessed so much radical change in her life that I sometimes wonder how she coped with it all. She also outlived her husband, and her son in law – my 2 x great grandfather. We have not yet found the record of Mary Ann Stephens’ baptism. If such an event took place it would probably not have been when she was an infant, as her parents were Baptists. She was born on Sunday 4 September 1792(2). 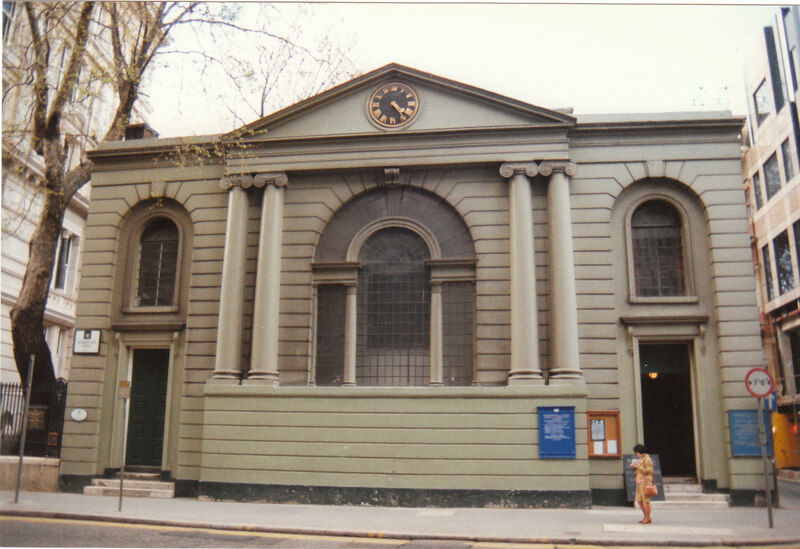 As I mentioned on the page relating to her parents, the fact that Mary Ann’s birth was registered at the Baptist Church at Little Prescot Street, Goodman’s Fields, London, may have some connection with the activities of her uncle – Thomas Hunt, the Baptist minister. When Mary Ann was born Thomas may well have been active in that church; he had become a Minister there in 1791, and did not begin his ministry at Watford until 1793. On Mary Ann’s birth registration document the home parish of her parents was stated as Allhallows, London Wall, so presumably the family was living on the northern side of the city of London . Mary Ann’s father died when she was about ten years old(3), and before she was twenty her mother had also died(4). As the elder sibling she may well have had to accept responsibility for the care of her younger sister, Eliza Stephens, but we do not know this for certain. In her will (5), Mary Ann’s mother stated that the interest on an investment in Government stocks was to be used by her executor for the benefit and upkeep of her two daughters until they each reached the age of 21. The executor – William Hunt, an uncle to Mary Ann and her sister – may well have played a part in looking after his nieces’ welfare. The only fact that we know about Mary Ann’s youth is that, as mentioned on the page relating to her parents, in 1805 she entered into an apprenticeship jointly with mother(6). As yet, I do not know whether she completed the apprenticeship, or the trade in which she was apprenticed. Mary Ann Stephens was a beneficiary of her mother’s will when it was proved in 1811. In addition to the above mentioned investment, which was intended to finance the well being of her and her younger sister, she was also left her a half share of £672. 19.11 stock in the navy, 5% annuities in the books of the Bank of England. This was to be looked after by her uncle, William Hunt, until Mary Ann was twenty one years old. When Mary Ann was twenty five years old she married a Printer and Engraver named Nathan Archer. Nathan was aged twenty four at the time; he and his family will be discussed at some length later in this text. The marriage took place, after the calling of banns, on Tuesday 3 June 1817 in the church of St Btolph without Aldersgate (pictured left), which is just within the walls of the City of London(7). I do not know what state of decoration and repair this church was in on the day in question, but I can tell my reader that it is now kept in beautiful condition. A Georgian building, which was rebuilt in 1788-91 by Nathaniel Wright(8), it is painted green on the outside, and has a superbly decorated interior with a splendid gallery. I sat in this church a few years ago, imagining Nathan and Mary Ann marrying on what I hope was a sunny summer day. Yes – I know – this is a rather unrealistic enterprise, given that I have no idea what the bride and groom looked like, or what the weather was like. However, I like to try to understand the people I research, and therefore frequently indulge in such activities. The parish register entry shows that two members of the bride’s family – Eliza Stephens, her sister and William Hunt, her uncle, signed as witnesses to Mary Ann’s marriage. Both bride and groom signed their names with well-practised signatures that seem to testify that these people had benefited from a decent education. Doubtless, many members of the Hunt family attended. What a shame that both of Mary Ann’s parents had died several years before this event. Apart from the Apprenticeship grant that Mary Ann had received in 1805, by the end of 1817 she had benefited twice more from the trust established by John Bankes(9). In 1815 she was paid the considerable sum of £70 towards her costs in setting up a business. This is very interesting, as it tends to suggest that the apprenticeship Mary Ann had entered into with her mother in 1805 had benefited her, and enabled her to work to support herself. After her wedding in 1817 the Bankes Trustees paid Mary Ann a marriage grant of £80. On their marriage entry both Mary Ann Stephens and her spouse were stated to be living in the parish of St Botolph, Aldersgate. In many cases, such statements cannot be taken as accurate residential evidence, but it seems quite likely that this one can. The evidence I have about Mary Ann’s family suggests that, in the main, they had been resident within the City walls, and the business addresses I have for Nathan Archer in the period up to 1817 are also located in the City of London. In 1814 he had a printing press nearby at 6 Long Lane, West Smithfield , and in 1817 he was at the same address(10). Long Lane, Smithfield was an address that cropped up more than once in the Archer family, being the address of his brother – Thomas Archer (1786-c1866) and his family between 1816 and 1822(11). Nathan and Mary Ann made a number of moves from one location to another, as will be shown later in relation to Nathan Archer’s business. For now it will suffice to say that by 1830 they were living at 26 Tabernacle Walk, Finsbury – just to the north of the City of London and opposite the Wesleyan burial ground(12). This was their address when their only known child was born. According to an annotation on her baptism entry Mary Ann Archer made her entrance into the world on 17 September 1830. Her parents had been married for thirteen years by then, and it seems unusual that they took so long to produce a child. However, I have found no trace of any previous children being born to them, and the records of the Haberdashers’ Company state explicitly that Mary Ann Archer was their only child. At the time of the 1841 Census(13) Mary Ann (Stephens) Archer was living with her spouse and child at 15, Old Street Road. The family was accompanied by an apprentice printer – Thomas Green, enumerated as aged 15. Nathan’s occupation was stated as “Printer”, and all the members of the household were recorded as having been born in Middlesex. I have no reason to suppose that life was anything other than normal for the Archer household at that time. However, soon after this the family fortunes were to change drastically, as on Monday 10 March 1845 Nathan Archer died. Nathan’s death, at the age of 52 would have been a shock in itself. However, the trauma of the occasion can only have been worsened by the fact that he died in a lunatic asylum(14). I shall deal with this matter when treating Nathan Archer, later in this chapter. It will suffice, for now to note that his death left Mary Ann to fend for herself. She never re-married. I have not yet managed to trace a will for Nathan Archer, and as there is no record of the taxation of his estate in the Death Duty Registers, it seems likely that his estate was of quite low value. Of course, it is possible that he had passed on his property before his death, and therefore there was no need for a will. At any rate, as I shall show, the available evidence suggests that Mary Ann (Stephens) Archer probably did not have an easy time financially after the death of her spouse. The censuses of 1851 shows Mary Ann living with her daughter in rooms with her daughter at 1 Trafalgar Road , Haggerstone, Shoreditch(15). Fifteen months later, on 7 June 1852, her only daughter was married at St Mary, Haggerstone. Mary Ann (Stephens) Archer doubtless attended the wedding, although her name did not feature in the record of this event(16). Our next sighting of Mary Ann is on 7 April 1861, when she was enumerated on the census of that year(17). She was still living in Haggerstone – this time at 16 Pownall Road , a lodger in a house that was occupied by George Wiggins, Box Maker, and his family. The interesting thing about this record is that it describes her as being of independent means – often a sign of a good financial status. An annotation on this record that I cannot quite decipher makes mention of a legacy. It may be that Mary Ann received an inheritance around this time. When the 1871 census was taken Mary Ann was again living in Haggerstone, at 32 Broke Street (18). She was apparently living in rooms in the house of John Fisher, a Clerk, and his family, and she was again described as being of independent means. It may appear reasonable to suppose that Mary Ann (Stephens) Archer was living in Haggerstone throughout the period 1851-1871, and that is quite possible. However, we need to bear in mind that the censuses only give us a snapshot view of the population, taken on a specified date every ten years, and we do not know whether people have moved about within each ten year period. In the 1881 census Mary Ann was recorded as a household head, an annuitant living at 71, Shrubland Road , Dalston, Hackney(19). Living with her were her daughter – Mary Ann (Archer) Smith, a widow whose husband had died in 1875. She was accompanied by two of Mary Ann (Archer) Smith’s children, Jessie Alice Smith aged 24 and George Smith aged 22 – both employed – and a daughter of Jessie Alice Smith, aged 2. The facts that (a) Mary Ann was the household head, and (b) her daughter’s occupation was shown as ‘lives with the head of family’ indicate that Mary Ann was supporting her daughter, rather than the reverse. This census entry is particularly interesting, as it shows members of four generations of the same family living in one household, and thus provides evidence of kinship networks among my late nineteenth century forebears. In 1881 Mary Ann was eighty seven years old, and the head of the household. As her household was one of three enumerated in the building, it seems that the house in which she lived was divided up into three different groups of rooms and rented out. It appears, therefore, that she did not have her own house. On Charles Booth’s Poverty Map (1889) the general condition of the inhabitants of Shrubland Road was described as ‘Fairly comfortable – good ordinary earnings(20). In contrast to her parents, Mary Ann lived to a considerable age. Her death certificate(21) shows that she died on 16 November 1885, aged ninety two. The cause of death was said to be Senile Decay and Bronchitis. She had, apparently, been suffering from the latter complaint for seven days. The event was reported to the Registrar by her grandson – George Smith – on the day it occurred. He had been in attendance at her death, at 58 Pownall Road, Haggerston – the same street as she had been enumerated in on the 1861 census (see above). I have not traced a probate record relating to Mary Ann (Stephens) Archer. Although she had been described as of independent means on the above censuses, I surmise that her assets were probably few at the time of her death, and it is likely that she did not leave a will. She did, however, leave her daughter, and she and her family will be discussed on another page. I now turn my attention to consideration of the life of Nathan Archer, Mary Ann’s husband. If you would like to see an abbreviated family tree for Nathan Archer, Printer (c1793-1845), his wife – Mary Ann Stephens – and child you can do so by clicking here. 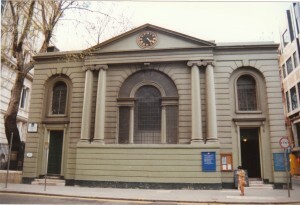 Nathan Archer was baptised at the church of St John Baptist , Finsbury, Clerkenwell, on 17 February 1793, having been born on 8 January 1793, the youngest known son of Thomas Archer and Hannah, his wife(22). Hannah Archer’s maiden name was Bide(23). Thomas Archer was a Watchmaker by trade, and at the time of Nathan’s baptism he lived, presumably with his wife and family of five children, in the Clerkenwell area of Middlesex(24). The baptism records of Nathan Archer’s siblings indicate that the family was resident in this area at least for the period c1786 to c1796. They were all baptised in churches in the Clerkenwell area(25). For the benefit of readers who have not seen a nineteenth century apprenticeship indenture, I shall now briefly outline its contents. The apprenticeship agreement bound the apprentice to his Master, and laid down, in strict terms, the conditions attached to the agreement. Such agreements tended to follow a standard form of words. In return for this commitment, the Master undertook to teach the skills of his trade to the apprentice, and to provide him with food, clothing and lodgings. The terms of such agreements may seem over-proscriptive, and even in Nathan Archer’s day they were somewhat anachronistic, having been unchanged for many years. It was important to the Master to ensure that the young man who was being taken into his business – and possibly his home – was going to behave himself in an acceptable manner. The fact that what may be termed licentious behaviour was specifically precluded by the agreement bears witness to the fact that when these terms were drawn up it must have been believed that such behaviour was likely to occur if such strictures were not laid down. This point may be usefully borne in mind when we learn of unruly behaviour by young lads today! Nathan became an apprentice at age thirteen, and the agreement was to last for seven years. He served his term, and on Tuesday 6 April 1813 applied for the Freedom of the City of London . However, Nathan apparently decided that he did not wish to be a Freeman of the Patternmakers’ Company, but would prefer to be a Freeman of the Stationers’ Company. I have no idea why he reached this decision. The record of his Freedom shows that he had stated his reasons to the City authorities, but they are not cited in the document. It is evident, however, that Nathan’s arguments were accepted, because he was granted the Freedom of the Stationers’ Company by Redemption during April 1813(28). When obtaining a Freedom by Redemption a person had to pay a fine to the relevant company. The City record shows that the amount of this payment was ‘forty shillings and eight pence’. However, the records of the Stationers’ Company show that the amount paid was ten pounds(29). So, at the age of twenty, Nathan Archer had become qualified to carry out business in the City of London in the Printing trade, and the evidence suggests that he wasted no time in commencing his operations. 1814: 6 Long Lane, West Smithfield . Press. ‘Notice is hereby given, that the Partnership lately subsisting between us the undersigned, Alfred Gatherwood (sic) and Nathan Archer, as Printers and Stationers, the business whereof was formerly carried on in Shoreditch, and afterwards in Chiswell-Street, both in the County of Middlesex, is dissolved by ‘mutual consent from the 17th day of May last : As witness our hands the 5th day of July 1823. We do not know for how long Nathan was in business with Alfred Catherwood. The Guildhall Library Manuscripts Department, in the City of London , holds records of policies issued by the Sun Alliance Insurance Company, and these contain a number of listings relevant to Nathan Archer and his business. These records cover the period 1814 to 1839, and generally confirm the above addresses. Directories are very useful in this regard, and these are available for viewing at almost any major London records repository. In the Post Office Directory of London , 1841(32) Nathan Archer was listed as an Engraver at 15, Old Street Road. This was not just a business address. The entry on the 1841 Census covering Nathan’s household shows that he was living at that address with his wife and child, accompanied by a fifteen years old apprentice printer named Thomas Green(33). As I mentioned above, Nathan Archer died in Bethnal Green Asylum. This establishment was housed in an Elizabethan mansion. At one time it had been regarded as a fine building, but by the 1840s it had been used as an asylum for over 100 years, and was in a run-down condition. A Select Parliamentary Commission Report in 1828 pointed to the insanitary and harsh conditions in the asylum. I quote two passages(34). ‘…on the Monday morning, even in November, (and as one witness stated, in frosty weather,) they were rubbed down with a mop, dipped in cold water, like so many animals’. On receipt of this report the authorities considered closing down the asylum, but instead they appointed two Medical Resident Officers, and a process began whereby the conditions were improved. Buildings were rebuilt, less harsh methods of care were instituted, baths were introduced, recreation facilities were provided, diet was improved and more staff were employed. By the time poor Nathan arrived there it would seem that the conditions in Bethnal Green Asylum were relatively humane, but I am sure that they would still have been extremely distressing. On his death certificate Nathan’s demise was attributed to ‘Paralysis'(35). Causes of death stated on death certificates issued during the early years of civil registration are often considered unreliable. Medical knowledge has advanced greatly since those days, and therefore some of the causes of death stated on these documents can appear imprecise. In this case I have pondered the demise of poor Nathan Archer over many years, wondering what was the cause of his ‘paralysis’? Maybe he had a stroke, or suffered from meningitis, or …something else. In the Autumn 2006 edition of Cockney Ancestor , the Journal of the East of London Family History Society, Anne Giller discussed the death of an ancestor in Hanwell Asylum, Middlesex(36). The author noted that the cause of death was “Paralysis”. She had investigated this nineteenth century cause of her man’s death, and identified it as the syndrome “General Paralysis of the Insane”, which ‘was first identified in France in the early nineteenth century and recognised in England by the 1840s. It was comparatively common among the causes of asylum admissions. The Report of the Metropolitan Commissioners in Lunacy (1844) identified a rate of 32 in 213 admissions with this diagnosis at Hanwell Asylum. It was not until the early twentieth century that it was discovered to be caused by a form of syphilis that attacks the nervous system. ‘General paralysis of the insane (GPI) was one of the most devastating diseases observed in British psychiatry during the century after 1840, in terms of the high number and type of patients diagnosed, the severity of its symptoms and,above all, its utterly hopeless prognosis. Of course, it is possible that Nathan Archer’s death was not caused by General Paralysis of the Insane – we shall never know for sure – but it is at least possible that this was the case. If this was the way in which Nathan Archer met his end, we may have reached an understanding of aspects of his character and lifestyle, and, of course, his final suffering. What a tragic end, and how awful for his wife and child. What must they have gone through? One can only imagine. It has been suggested to me that the fact that Nathan’s wife – Mary Ann Stephens -lived to a ripe old age suggests that he did not suffer from syphilis, and I see the sense of this argument. However, although we know that they were enumerated together in 1841, we can never know anything about the relationship between these two people, and therefore the strength of that argument cannot be evaluated adequately. Isn’t it amazing where family history takes us? We start out with names on a pedigree table and gradually we gather information and get to know quite a lot about these individuals – warts and all! Those names on a sheet of paper are brought to life, and we learn that all were human beings, with all the strengths and weaknesses that people have. We certainly have to be prepared to learn the bad as well as the good when we embark on this hobby! Four days after his death, on 14 March 1845, Nathan was buried at City of London Cemetery, Tower Hamlets(38), just outside the eastern limits of the city of London. The record shows that the burial was paid for by his brother – Samuel William Archer. Bearing in mind that he appears to have been living to the north of London , one may wonder why Nathan was buried outside his locality. A possible reason is simply that Bethnal Green Asylum had access to an area of Tower Hamlets Burial Ground, and if relatives of the deceased did not arrange burial elsewhere, this was where inmates were interred. However, as it has not proved possible to locate the records of the asylum, I have not been able to investigate this.